The provincial government is doing a review of postsecondary education (PSE) this year, hoping to find ways to save money and reduce the deficit. The PCs have greatly increased spending on PSE since coming to power in 2003 and tuition at MUN is the lowest Canada outside of Quebec, so there is definitely room for cuts. But is cutting PSE smart policy? Here are a couple of charts showing the unemployment rate according to level of education for people aged 25 to 44. The first one is for Canada and the second is for Newfoundland and Labrador. The first thing that pops out is that lines on the Canadian chart are much closer together. In the rest of Canada, the difference in unemployment rate between high school graduates and university graduates is only 2% (7 and 5 respectively). In Newfoundland & Labrador the difference is 12%! 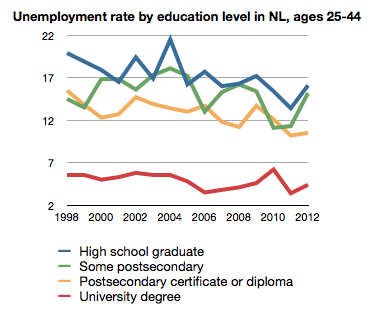 That means that having a university degree makes six times as big a difference in NL as it does in the rest of Canada. 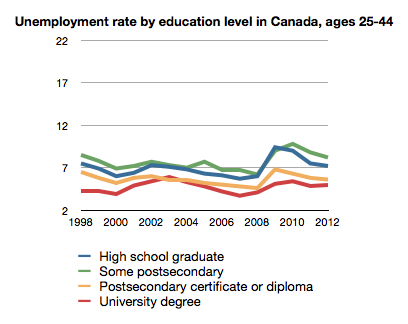 We also see that a postsecondary diploma or certificate reduces the unemployment rate by about 5% in NL compared to about 2% in the rest of Canada; and some postsecondary is better than nothing in NL, while in the rest of Canada you are better off with no PSE than doing some PSE and not graduating. All of this indicates that postsecondary education (PSE) is much more valued by the NL labour market than by the Canadian one. Credit to the PC government for strongly investing in PSE and keeping tuition low. Hopefully they remember the value of this investment in Budget 2014. More important than investing (and often wasting) more money into university education is to outline priorities, and attempt to streamline the process. Currently, very little of the funding that is touted as a saviour for education is actually used to educate students; tests, resources, instruction, etc. Instead it goes to funding the institution. I'm paying for the researchers and their research, for the clubs, for the societies, and more. I am not saying that such programs should not be funded at all, but appending such programs to education can bog down the entire system. We need to decide what universities and education means to us as a society. Do universities exist to educate students? is that their purpose? Because the current system doesn't seem to support that notion. Of course money can help education, but if the system is poorly defined, designed, and implemented that money won't be used to its full potential. I think you are taking a very narrow view of what a university should be and what education is. Are you so sure that those clubs and societies that students take part in are not preparing them for life and their career outside of university? Or that research is a waste of money, with no benefits to the wider society? In any case, the data presented above provides strong evidence that whatever it is that students acquire in university, it is highly rewarded by the NL labour market. We should be careful tampering with something that is working so well. I think you are taking a very narrow view of my previous comment. I said that what we must do is better define what university education; what we expect to get from it. Of course scientific research helps, but should students be paying for that research? Is it right to impose such a requirement on every student? Same with clubs and societies; of course they have value but is it right to require every student to pay for these things? If a student is not involved in research, or clubs, or societies, why should he/she be obligated to fund them? Effectively, going to university is an investment in your future. One goes to university expecting that once their education is complete they will have an easier time obtained better employment (this seems to be the point the original article was making). The extra stuff is nice, sure, but employers don't care about what clubs or societies you are in. They care about your degree and generally other personal and interpersonal skills, not so much how you got them. If people need these societies, clubs, etc. in order to gain such skills that is perfectly alright. But these organizations should not burden the rest of the student body. If these clubs were instead defined as courses those taking advantage would be required to pay. Why is our current reality any different.